Mojitos are a Cuban treasure of a cocktail. The mint manages to cool us down no matter what the outdoor heat, while the rum relaxes our senses, lime brightens the flavor, and sugar sweetens the deal. Put a twist on the classic mojito by adding a few strawberries to transcend the cocktail from refreshing to revitalizing. 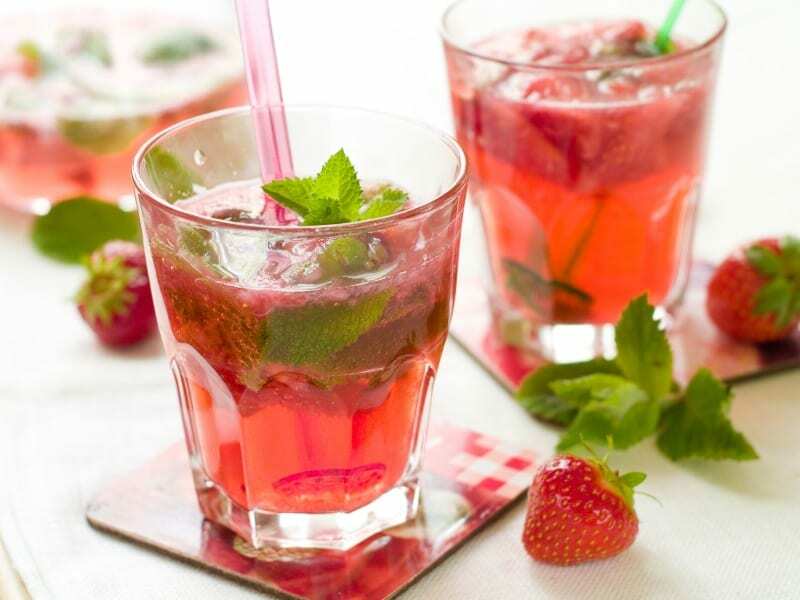 Discover how to make perfect strawberry mojitos every time. Place the strawberries, simple syrup, and mint sprig in the chilled bottom portion of your shaker. Muddle these ingredients together until well crushed, about 1 minute. Squeeze the juice from the lime into the shaker. Add rum and some ice. Shake. Put a mint spring in the serving glass. Fill the glass with ice. Strain contents of the shaker into the glass. Fill the rest of the glass with soda water. Stir (stirring with a sugar cane swizzle stick is a bonus). Garnish the rim on the glass with a strawberry slice. Serve immediately. This crowd pleasing variation will serve around 6 drinks. In a large pitcher muddle together about a pint of strawberries, 24-30 fresh mint sprigs, and 9 oz (or 1 ¼ cup) of simple syrup, until well crushed. Stir in the juice of three limes, 12 oz of light rum, and ice. Prepare 6 glasses for serving by filling them with a mint sprig and ice. Pour the mixture in the pitcher evenly into each glass, straining as you go. Fill your glasses the rest of the way with soda water. Place a sugar cane swizzle stick into each glass and stir. Garnish with a strawberry slice, if you wish. Serve immediately. While you can buy premade simple syrup in the grocery store, it is infinitely better to make your own. It’ll last for a long while in your refrigerator, and you will know exactly what is in it. This recipe is for a larger batch than you’ll need for the mojitos—unless, of course, you’re wanting to make a bunch of mojitos for a crowd. Stir together the sugar and water in a saucepan. Heat until sugar is completely dissolved. Let the mixture simmer for a few minutes in order to let it reduce. Pour the mixture into a closeable clean glass bottle with the aid of a funnel. Let it the bottle and mixture therein cool to room temperature, then place in the fridge for storage. Use at will, it’ll keep for several months.